Lwów, 1918. After the pogrom, children who have received food from a soup kitchen, pose on a sidewalk, with pitchers and soup pails. Return to Digital Gallery Return to Main Record Lwów, 1918. 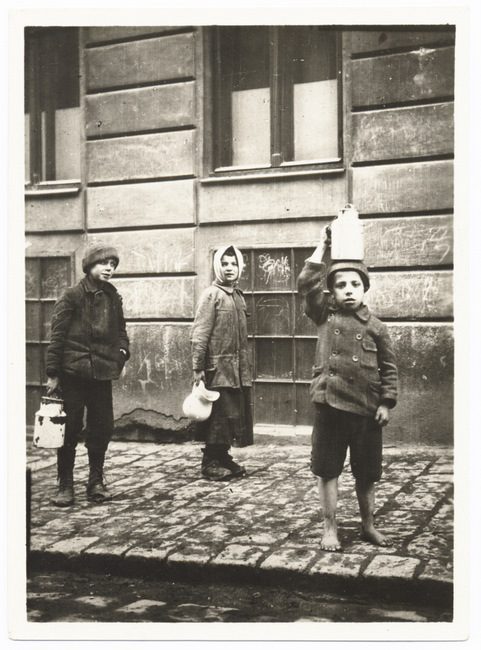 After the pogrom, children who have received food from a soup kitchen, pose on a sidewalk, with pitchers and soup pails. Lwów, 1918. After the pogrom, children who have received food from a soup kitchen, pose on a sidewalk, with pitchers and soup pails. The youngest child is shoeless.